One of the nicest things that comes with the perks of being watch blogger, is the fact that every once in a while we get to wear a cool watch. When you experience pleasure out of wearing that timepiece, something’s good about it. 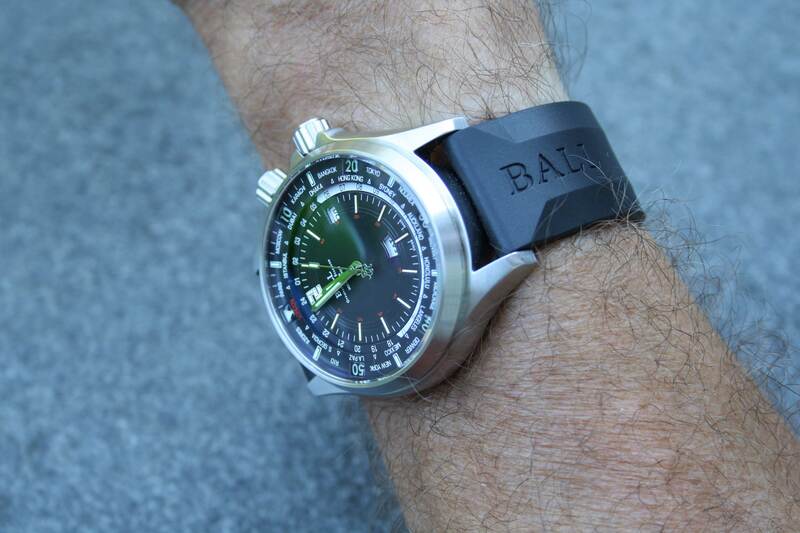 For a bit more than a week, I got to wear the Ball Watch Engineer Master II Diver Worldtime. A mouth full and – at first – a very strange combination of watch ‘types’. 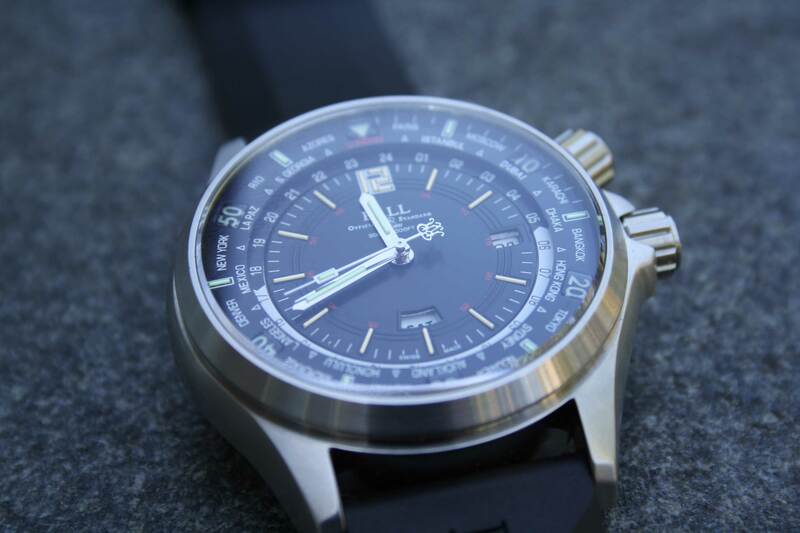 After all, it’s is not really common for a Diver to enhance a worldtimer function. 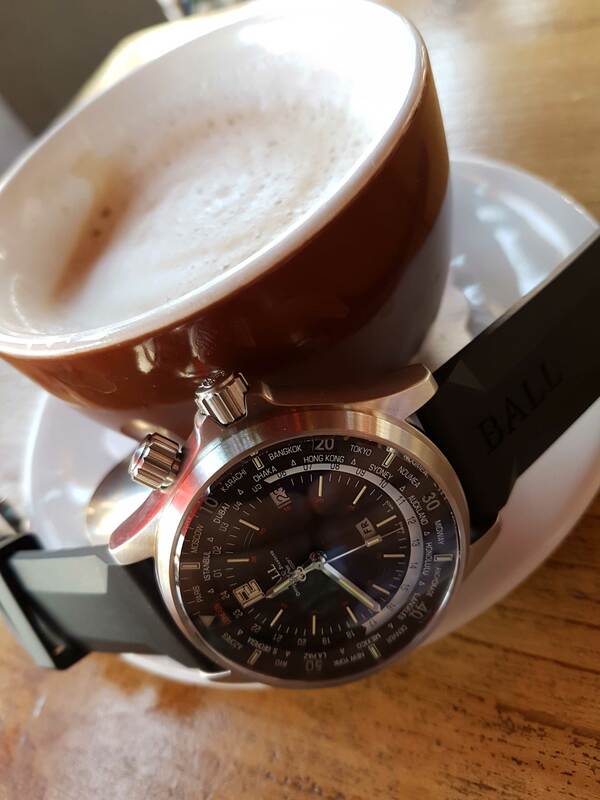 Anyhow, I wore the watch for a week and got a really good idea of what Ball wants to accomplish with their watches – or at least with this one. First of all, let me say that this watch is very robust for its class (price is just above €2000) and it doesn’t feel like you would expect. 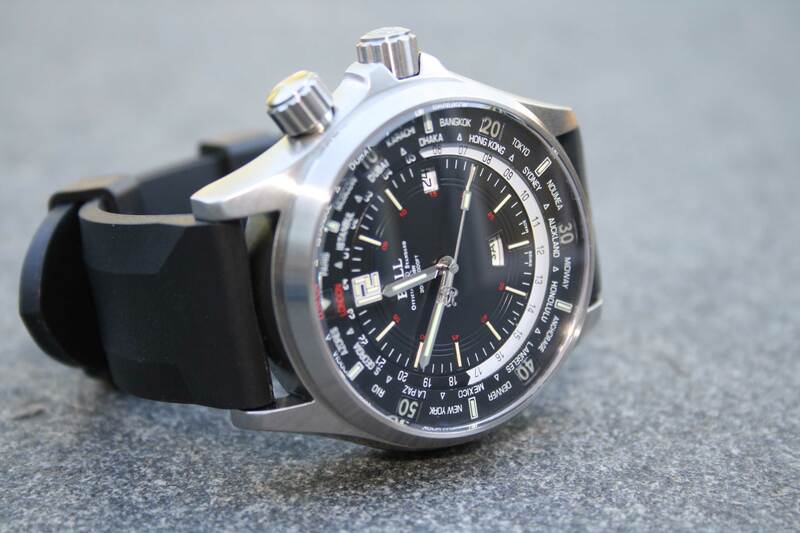 After all, you get a Diver – water resistant up to 300meters – with a worldtimer, day and date function. On top of that, there are very cool Tritium tubes placed on the dial, hour markers, hands and inner bezel to light up the watch during the darkest hours. To be honest, first thing that came to mind when I picked up the watch was its weight. We received the version with the rubber strap and for a watch with such lightweight strap, it felt rather heavy. However, during the time I wore it, it never felt as a concrete brick around my wrist. The rubber strap makes it a really comfortable timepiece to wear, I could imagine this would be different with the steel bracelet version. Personally I have no hard feelings when it comes to the weight, diameter and height of this watch. It is a sporty looking timepiece and the Diver aspect makes it actually easier to accept the fact that it is rather buff. 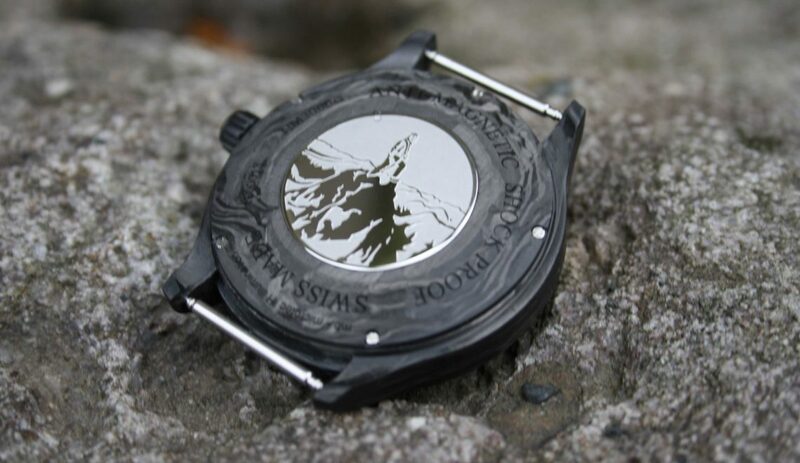 The watch has a diameter of 45mm and a height of 15.4mm. Underneath the dial houses the Ball RR1501 automatic movement. 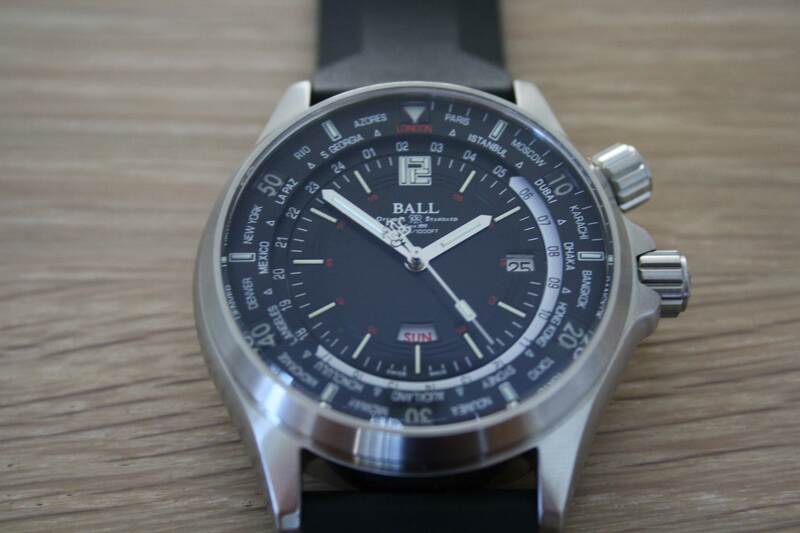 It is based on an ETA 2836 movement, but the watch makers at Ball added a special Worldtime module to it. Making it the watch you see on the pictures. 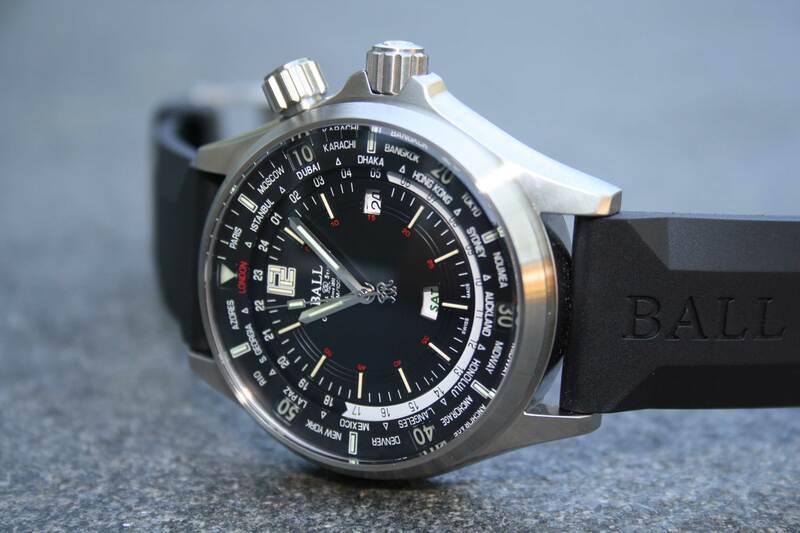 What attracted me most of all, was the fact that this brand uses their characteristics Tritium gas tubes to light up the watch during dark times. 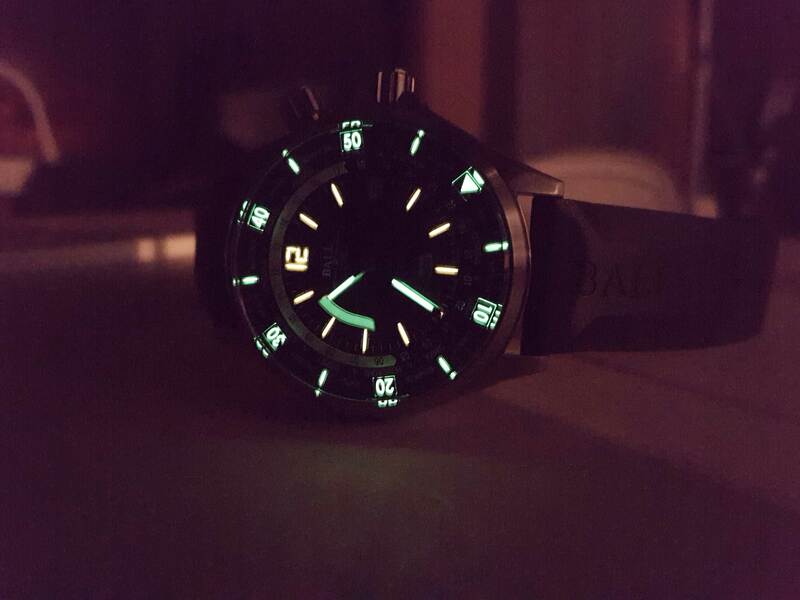 As most of the brands use SuperLuminova, Ball chooses to pick a great contender: H³, also called Tritium gas. The biggest difference with traditional Lume is the fact that these tubes provide the watch with a bigger luminous effect. However, the effect will deteriorate over the years. Sometimes, we hear people thinking about the radiation effect of Tritium used in watches, which is proven to be far less dangerous than thought. I personally really love the effect of this material. As you can see in the picture, it provides a very nice look with different colours and a great brightness. I think Ball did a very good job when it comes to the quality they give you. Of course people in the industry will categorize this timepiece as being ‘affordable’, but I have to agree to disagree. A watch that costs around €2000 isn’t for everybody and it doesn’t have to be. However, if we compare watches of this price range with each other, it is safe to say this watch offers a lot of ‘bang for your buck’. First of all, Ball introduced a novelty when it comes to shock-resistance. They patented a case around the balance spring, ensuring less room for the coils in case of shocks effecting the movement. Ensuring that the watch withstands a force of 5.000G. That’s not bad at all. Besides that, it gives you a day-date function, a worldtime function and a water resistance of 300meters. The adjustability of both the worldtime function and the date windows is very easy and feels good. Sometimes a watch feels like breaking it when not handled with care, but this timepiece is robust in every way possible. What I also liked about the watch is the fact that they paid a lot of attention to detail. The dial has different levels to it and finishing is superb. There’s a lot of information displayed on the dial, but you can’t find any aspect that makes you think it’s cheap or not well fabricated. I like the fact that you get a good look at the gas tubes because of the slightly domed sapphire crystal. 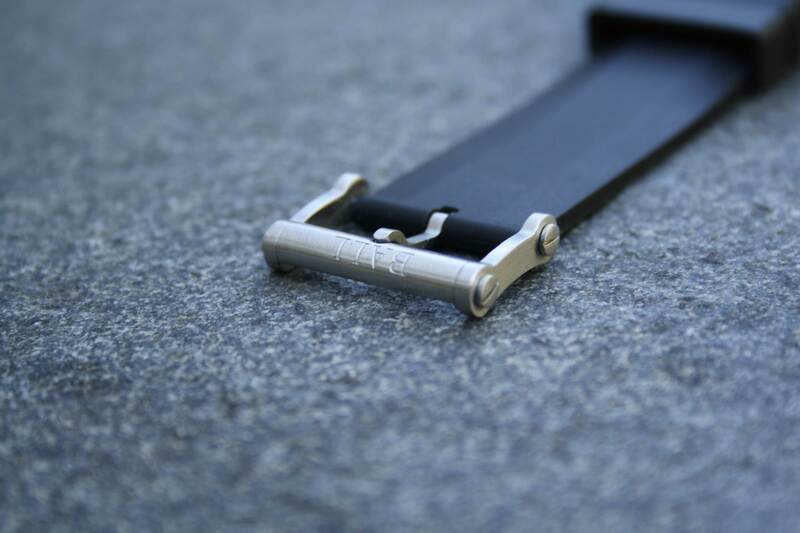 As well as the case of the watch and its design, the buckle fits the robust look perfectly. The screw crowns at the side, the brand name on top and the thickness match perfectly with the rest of the watch. I have to admit, I’m a fan of this watch. It meets all my expectations in a watch and for a price like that, I like you to find a watch that combines the same characteristics with this level of quality. Please keep in mind, we are talking about a specific price range here, so don’t compare it with worldtimers that cost a year salary. 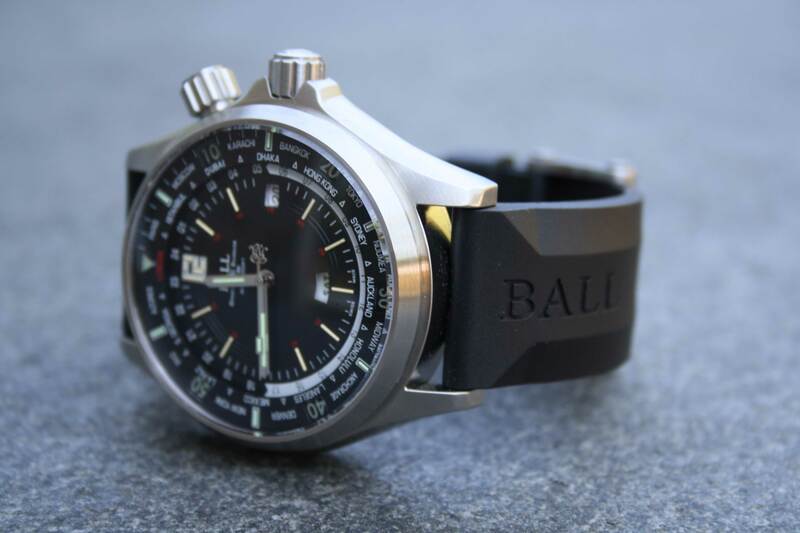 Ball did a very good job on this Engineer Master II Diver Worldtime. If I had to think of one point of improvement, it would be the weight and height of the watch. I say that because I don’t want to be too excited, but honestly I don’t see the need for those improvements at all. However, I would like to try on and feel how the steel bracelet version wears. I can imagine it becomes a bit too much then, but that’s just a guess at this moment. 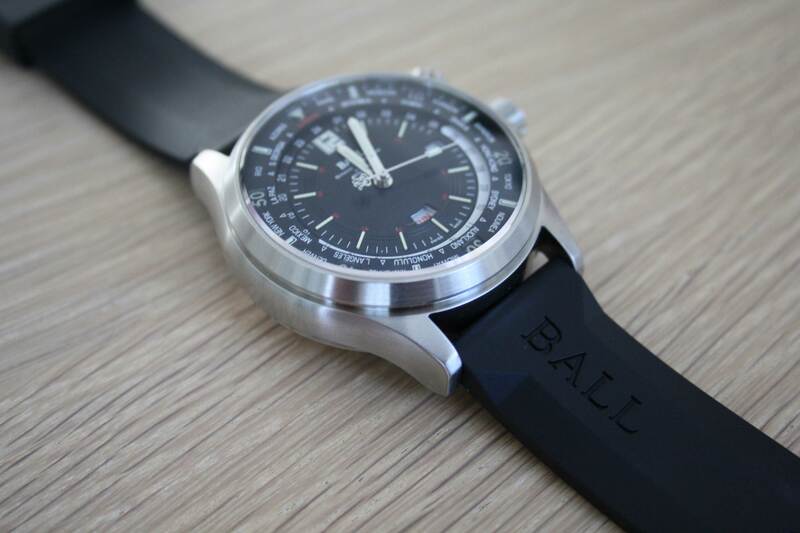 As far as my humble opinion is wanted, I would like to say that Ball did a good job on this watch. Would it be part of my personal collection? Yes. Why? Because I like a watch you don’t see that often and of course the overall product you get for this amount of money is great. I rest my case.